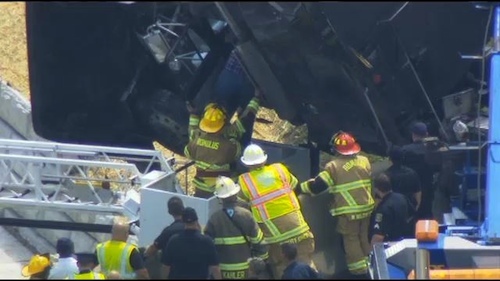 Tuesday was a busy day for big rig incidents, big enough for our trucking wall of fame. 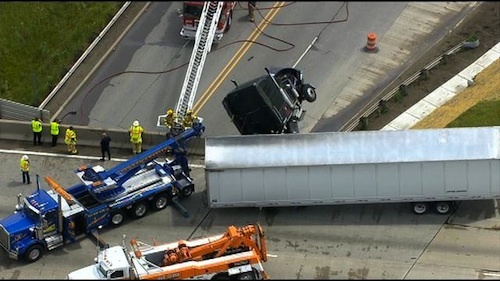 In Detroit, a freeway accident left a truck driver’s life hanging off the limb of an I-94 overpass until a heroic rescue by the Romulus fire department pulled him back to safety. The truck driver, George Parby, had been driving along the I-94 when a car in front of him abruptly braked on the rain-slicked roadway. "It was raining and the car in front of me applied its brakes, so I saw the red light and I also applied the brake and I started skidding left. When it started skidding, I said God help me. That was all that I said," explains the truck driver. Parby also says there were four lanes of cars on his left and he knew he had to do something to avoid slamming into any other vehicles. When he realized he was skidding to the left, he quickly turned the other way and his semi started skidding right, then hit the guardrail and went right over the bridge. Clearly not his time to go, the truck got caught before plunging off the side and Parby was stuck in the cab, with his life literally hanging on the edge. “The driver was dangling for an extended period of time inside the tractor, with the trailer acting as a counterbalance," explains Romulus Police Captain, Joshua Monte. Parby was trapped in a state of fear for over an hour before rescuers finally managed to pull him back to safety using a fire department bucket truck. Although the truck driver was obviously left in a state of shock, fortunately he managed to escape with only minor injuries and a whole new appreciation for life. Then about an hour later, another Tuesday trucking incident caused chaos in California. 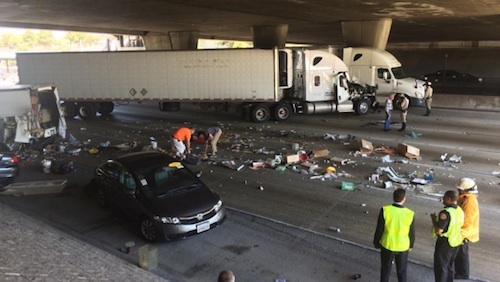 Just after 2:30 p.m. on the 210 freeway in Pasadena, a collision directly under the overpass left a big rig and many other vehicles in chaos. While details of what caused the crash have yet to be revealed, a semi, a box truck and two cars somehow collided under the overpass. It left four people moderately injured and household items that the semi-truck was carrying were left scattered across the roadway, temporarily shutting down the entire westbound 210 Freeway at Lake Avenue. Traffic had to be diverted off the freeway at Lake Avenue for hours until the accident site was cleared. One reason why I try to hug wife n kids cause I know there is possibility that I might not make it home !! I seen a Holland truck on 31 in Ohio today two feet off of a cars bumper . 31 is a two lane road , I also seen a Werner driver in Michigan today about a foot off of a rock hauler who wouldn't get out of the middle lane. These young totosterone filled young punks need the fear of God knocked in them .